The 60-day annual yatra commenced from the twin tracks on June 28 and is scheduled to conclude on August 26 coinciding with the 'Raksha Bandhan' festival. 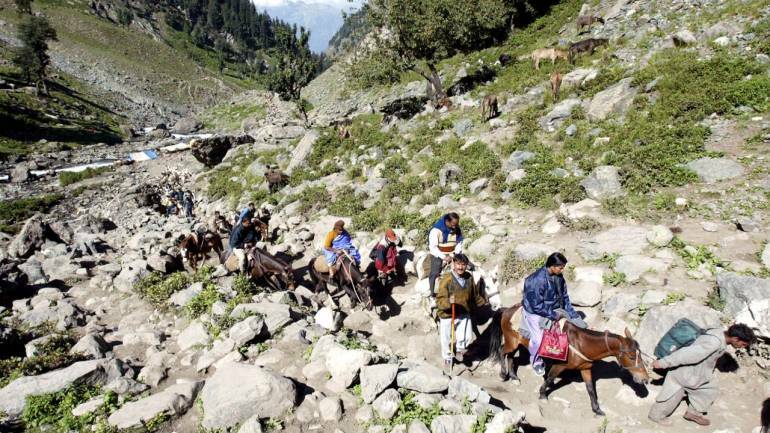 Another batch of 233 pilgrims left the base camp here today to join the ongoing Amarnath yatra in south Kashmir Himalayas, officials said. The pilgrims left the Bhagwati Nagar base camp in 11 vehicles amid tight security arrangements in the early hours and are scheduled to reach the twin base camps of Baltal in Ganderbal district and Nunwan-Pahalgam in Anantnag district later in the day, the officials said. He said while two vehicles carrying 93 pilgrims are performing the yatra from the traditional 36-km Pahalgam route, 140 more pilgrims comprising 106 men and 34 women have opted the shorter 12-km Baltal route. Till last evening, a total of 2,78,072 pilgrims had paid their obeisance at the cave shrine. However, the number of pilgrims undertaking the yatra has marked a sharp dip over the past fortnight owing to the early melting of the naturally formed ice-shivlingam at the sanctum sanctorum.